I bumped into this article via the CTC forums. It describes how human vision works and looks at the limitations our sense of sight has in the situations that confront us when in traffic. It is well worth a read both as a cyclist or non-cyclist. This winter has been a bit of a damp squib. Not particularly cold, not much snow, not enough sunshine. The warmer winters lead to lots of ice on the roads and paths sometimes several centimetres thick. As we live on a steep hill we generally do not take the bikes out when the roads are like this. Still, the upside of the damp squib winter is that spring seems to have arrived very early. Pretty much all of the roads and asphalt cycle tracks in and around Gol are free of snow and ice. So yesterday, with temperatures approaching 10’c it seemed like a perfect opportunity to kick start our cycling season. We decided to give our VSF T400s a spin seeing as they have been rather neglected in the last couple of years. They still have studded tyres on them which we decided would help if we did meet any snow or ice. Moose Too and Troll Too together with out old HEMA bike trailer. Note this now has a Weber coupling which is an excellent upgrade if you want to go touring with children. Why have the VSFs been neglected, you might ask? They are lovely touring bikes after all. 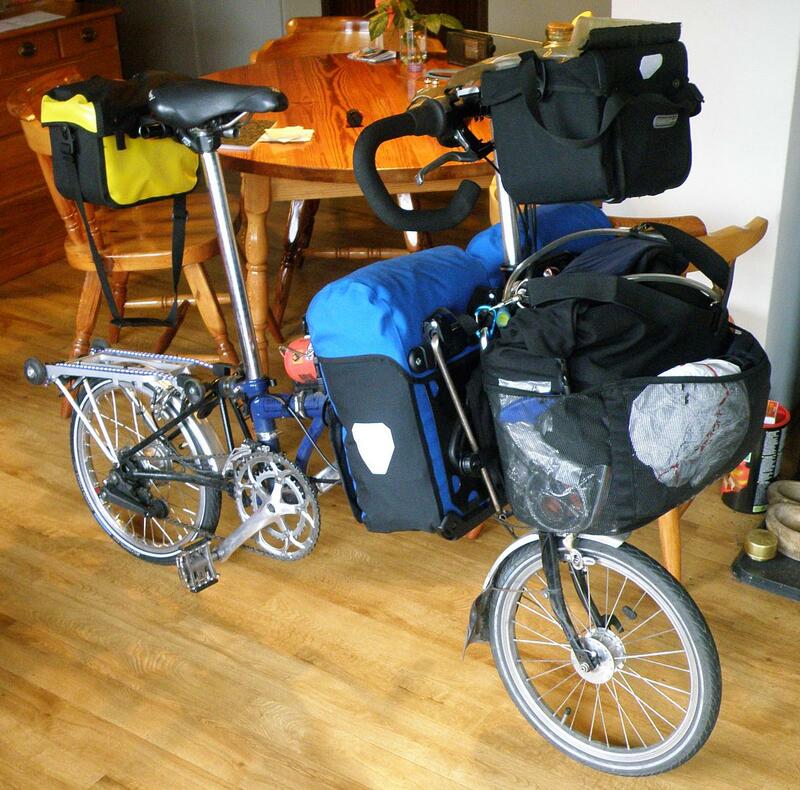 Well the reasons are simple, in the summer of 2013 Damae was pregnant so we took the 16 speed Bromptons to the NSCR in Germany and Denmark. This gave us lots of options for escape routes using public transport, in case we didn’t manage to complete the planned route and the Bromptons made it easy to get to the start point by public transport. Summer 2014, with a trailer in tow for the first time we ended up having to use the Moose and Troll. We chose to do this as it was much easier to get the trailer hitches to fit on the older bikes. I modified the hitches with plates to keep the hitches from rotating around the rear axle. The VSF T400 has horizontal dropouts and I ran out of time to try to work out how to bodge the hitches to fit these bikes. We realised fairly early on in the 2014 tour that the basic hitch that the trailer came with was not suited to cycle touring. The flexible section is a combination of a coil spring and an elastomer element placed inside the spring which, under stress conditions such as climbing or pushing on, makes the trailer oscillate and thus tug in the direction of travel. It takes a lot more energy cycling with a trailer bouncing on the hitch like this with every push of the pedal. Especially when climbing. 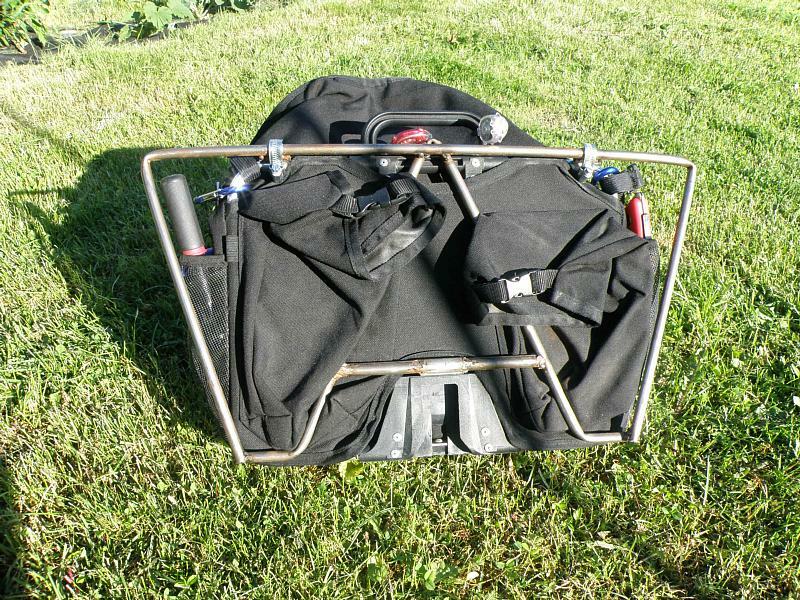 We are investing in some new gear for the 2015 season.The HEMA bike trailer has served us well and still works. However, the fabric is showing signs of wear, the plastic front window has cracked and the trailer is heavy. Without the front wheel it weighs in at around 17kg which is just too heavy for cycle tours. We have decided to get a Winther Dolphin XL with a Weber coupling. Whilst this is not the lightest trailer on the market it is a good four kilograms lighter than our old trailer. The XL has fewer ventilation options than the standard Dolphin trailer but importantly the XL has 6 cm extra headroom (76 cm). Given Odd Egill’s rate of growth that 6 cm might just give us one summer tour extra before we have to think of another way to take him with us on tour. I was unable to find a dealer in Norway that sold Winther trailers. I did manage to find a trade dealer who is the Norwegian importer who is willing to sell direct to us. We are waiting for delivery at the moment. The second change is that we need a bigger tent that was easy to put up. The Macpac Citadel is the most convenient of the tents we own when traveling with a child. The way the doors are placed in the inner tent mean we sleep parallel to the doors which makes getting in and out so much easier. This layout also gives good headroom for everyone when sitting on a mat chair. The two vestibules mean we can separate “safe” and “dangerous” items (for example the Trangia and fuel). We nearly bought a Helsport Fjellheimen Camp 6 but then changed our mind at the last minute and plumped for a Svea Camp 4 from the same manufacturer. This is a bit like the big brother of the Macpac Citadel with two entrances and two vestibules, (one small and one large) and like the Citadel you can sleep parallel to the inner tent doors. In addition the Svea Camp is part of Helsport’s “extreme” range of tents. This means that, although it is a bit heavy (6kg with footprint) it should give us plenty of space and stay upright in the worst weather that a Norwegian summer can throw at us. 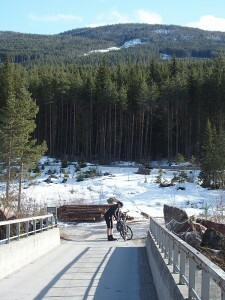 Back to our first outing of the season, we cycled up to Rotnheim to the bridge that leads to Øygard pukkverk. The stiff headwind, studded tyres and gravel on the cycle track made it hard going. 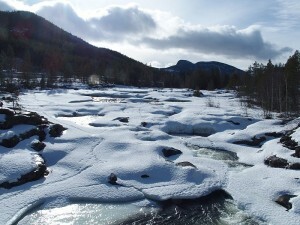 Up here there is still plenty of snow on the river. The old snow is still white here. Once stopped it was quite cold in the wind, there wasn’t really any shelter from the breeze. The first thing Damae did, after stopping, was to dig out her rain jacket. Now the season has started we can start planning shorter and longer trips. We need to start cycling as we were not able to keep fit by skiing this winter so our fitness levels are not what they should be. 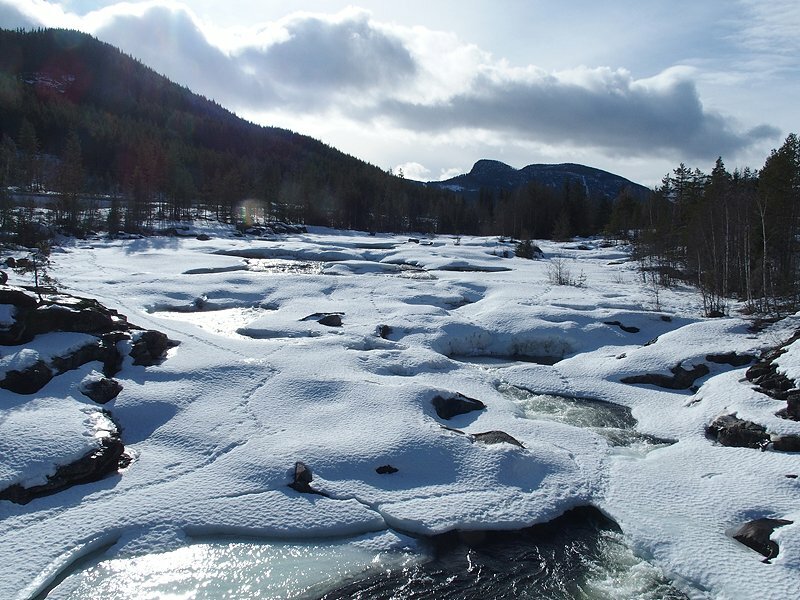 I would like to be able to do a five week tour in the summer to celebrate both my 50th birthday and five years of Life in Norway. However, we will have to wait and see what actually happens. 1) Tyre tread to fork cross piece. The tyre is a Schwalbe Marathon pumped up to near normal pressure. The cross piece is the one at the bottom of the triangle next to the rear hinge. The bike is upside down in this picture. The rear triangle has been opened out to accommodate a narrowed Nexus 8 Red Band hub. The OLD for the Nexus in this configuration is around 122mm. The rear dropouts have been widened by 1mm which is necessary to fit the Nexus dropout washers. The 1mm has been removed from the “back end” of the dropout which sets the hub a little further away from the cross piece than if the metal had been removed from the side of the dropout nearer to the front of the bike. 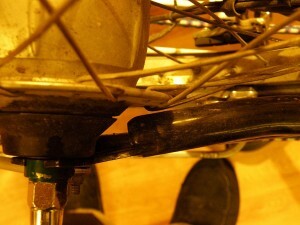 If you open the fork out to accomodate a hub with and OLD of 135mm then this gap will decrease further. 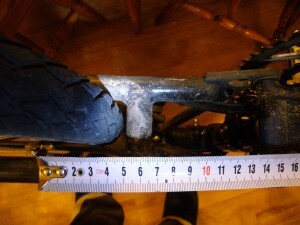 2) Sprocket to end of fork tube. This is a 16 tooth sprocket mounted with the dished side facing the hub. This is to push the chain line outwards a few millimetres. The white object on the left inside the ellipse is the sprocket and the end of the fork tube is to the right of it. Clearance is minimal but sufficient. The chain has been moved off the sprocket to take this picture. 3) Spokes on the non-drive side to rear fork tube. There is just enough clearance on my bike but I had to put a couple of small dents on the inside of the tube on Damae’s bike. If there is any significant play in the wheel bearings then the spokes will start to make contact with the rear fork (as the front of the wheel will be pulled to the left by the chain). The bike is upside down in this picture. Spoke to rear fork clearance on the non-drive side of the Nexus 8 hub. 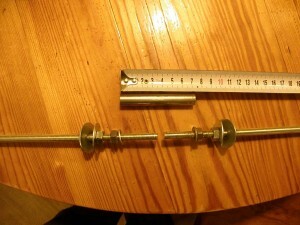 Here are a couple of pictures of the tool I used to spread the rear forks on our Bromptons. The assembled for spreading tool. The dropouts are clamped between the pairs of large washers. 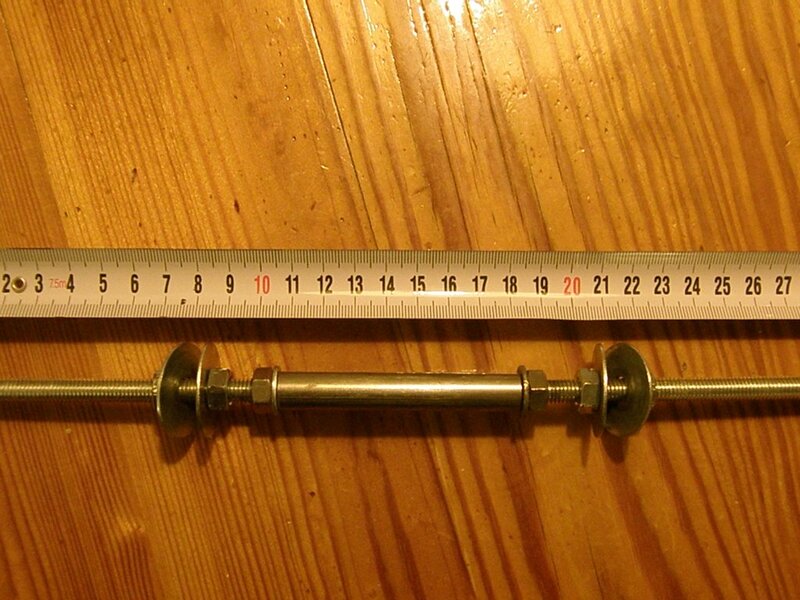 The section of steel tube is just over 7 cm long. The ends of the threaded bar slide into the tube. Once the spreader has been bolted to the dropouts, the innermost nuts are then screwed in against the steel tube thus pushing the threaded bar sections outwards. 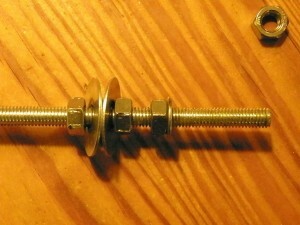 Detail view of the arrangement of nuts and washers on the threaded bar. The steel tube section slides on from the right. 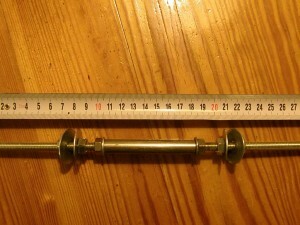 2) Take the steel tube and cut of a piece 7.5 cm long. 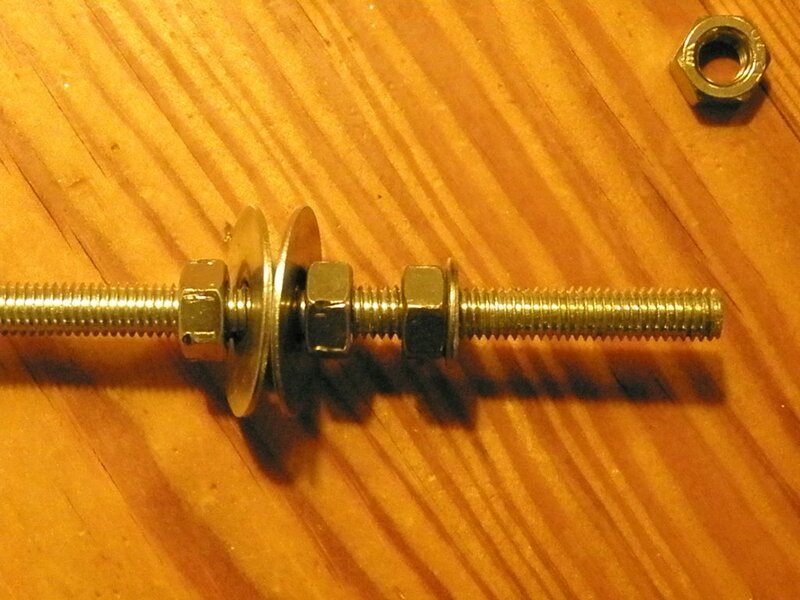 4) Screw on the screws and place the washers in the order shown in the third picture. How far do I need to spread my forks? This is a bit difficult to say. You need to spread the forks further (under tension) than the 122 mm required to fit a modified Nexus 8 hub. The steel that the forks are made of will bend elastically before it starts to deform permanently. With the tool in place I needed to wind it out to 138 mm on my Brompton which, when the tool was removed gave me a 122 mm opening. 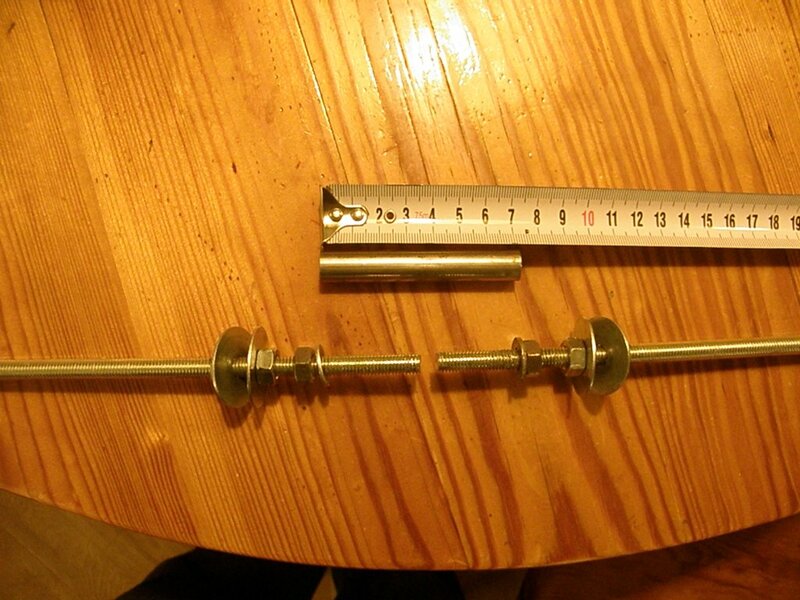 Damae’s Brompton needed the tool to be wound out to 140 mm before the Nexus hub would fit. If in doubt start with a lower value, say 130 mm. 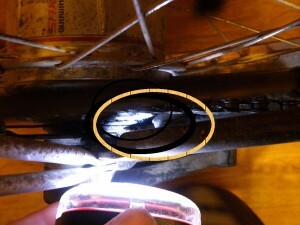 Remove the tool and measure the distance between the dropouts. Then adjust as required. You might need to bend the drop outs after spreading the forks so that they are parallel. Measure the gap when the dropouts are parallel again and adjust as needed. Disclaimer – what happens if something goes wrong? Use of this tool could damage you and your Brompton/bike. You are responsible for your bike and the modifications you make to it. I accept no responsibility for any damages or losses incurred by using the tool described in this post. I do not recommend opening out the forks to accept a hub with OLD of 135 mm. You will get clearance problems between the tread of the tyre and the cross piece on the fork near to the rear hinge. To fix this problem you will need to modify/replace the dropouts or find another way of increasing clearance between the rear tyre and the cross-piece. 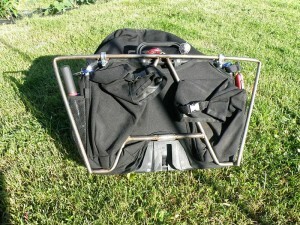 Here are some pictures of the piggy-back frame I made to allow me to carry Ortlieb panniers on my Brompton. This was a proof-of-concept frame I knocked up in a couple of hours with no access to tube bending tools. I never got round to tidying up the welds properly nor have I painted the frame. So be warned, it is not a pretty sight. 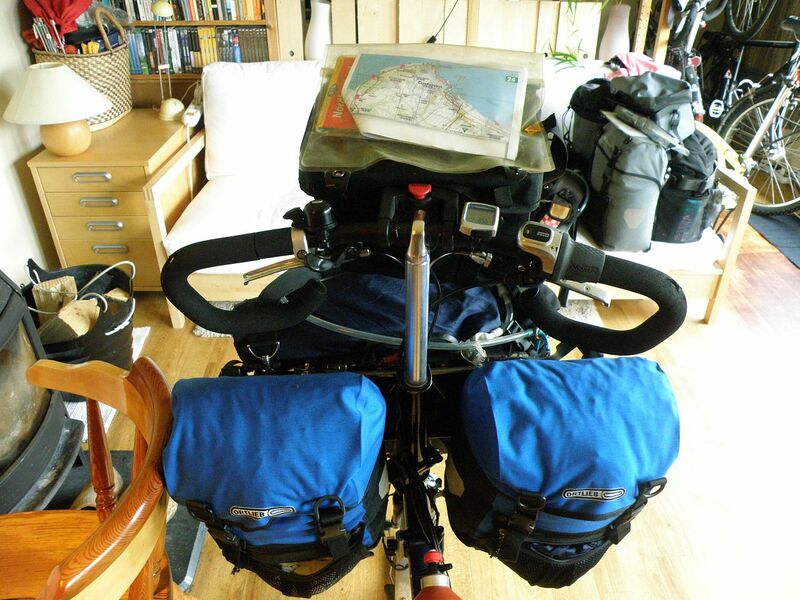 However, it has functioned perfectly whilst fully laden all summer (1100km including the Rallarvegen). The total load on the luggage system was 16-18kg depending on how full my water bag was. 1) The view from the rear of the Brompton touring bag. The frame is attached at the top with a pair of jubilee clips. 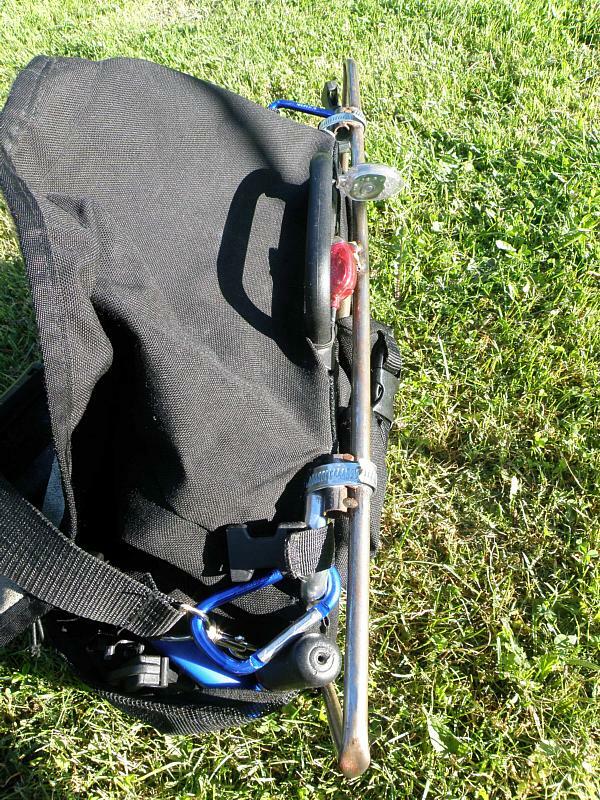 Most of the weight is transferred directly to the mount at the centre of the Brompton bag frame. This mount, in turn, sits directly on the Brompton luggage block. This seemed to be the most sensible way to do it at the time. I am not sure I would do it differently now, as it still seems to make sense. The piggy back frame from the back. The top bar looks more curved than it is. This is due to distortion from the wide angle lens. 2) Close up of the lower mounting point. There is an L-section piece of metal welded onto the middle of the bar. The bottom of the L protrudes forwards and sits in a little trough at the top of the plastic mount. 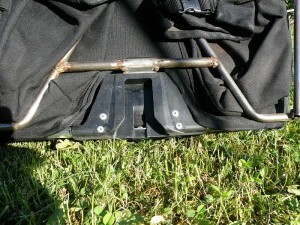 I don’t know if newer Brompton bag frames have the same feature. 3) View of the top of the frame and how it is fastened to the Brompton frame. The jubilee clips work a lot better than the fastenings I made myself. The clips pull the frame down so that the L-shape tongue is clamped to the plastic Brompton bag mount. 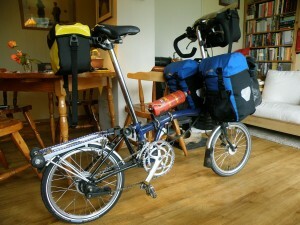 One of the problems of this design is that later Brompton touring bags cover the Brompton bag frame almost completely. You’d have to unpick part of the stitching at the top of the bag to be able to get a jubilee clip or other fastener round the top bar of the Brompton bag frame. This is one of the reasons why I plan to do away with the Brompton bag completely in the Mk 2 version. The other reasons is to be able to use Ortlieb front panniers on both sides of the frame and save the weight of the Brompton bag frame. Last weekend we decided to give our 16 speed Bromptons another test. The test was to cycle the Rallarvegen in Norway from Haugastøl to Flåm. We have wanted to do the Rallarvegen since we moved to Norway almost three years ago and the Bromptons would make getting back home on the train a little easier. We took it gently, mainly because Damae is now 26 weeks pregnant. 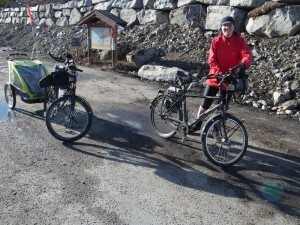 On the Friday we cycled from Haugastøl to Finse and camped at the DNT Finsehytta ‘campsite’. 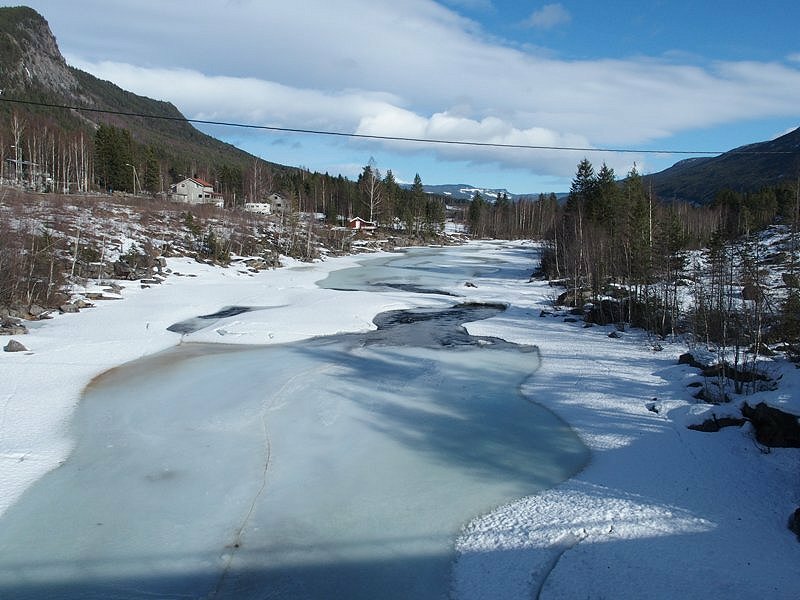 Saturday we cycled from Finse down to Flåm and took the Flåmsbanen back up to Myrdal. The weather was brilliant and the Bromptons created a lot of interest. The trip gallery is here. Our summer tour to Germany and Denmark was a great success. Not only did we follow the route we had planned (with two minor deviations) but nothing broke on the bikes or our luggage systems. We didn’t even get a puncture. The rear wheels were still true at the end of the trip and the gears, both the Nexus 8 speed hub and our front derailleurs worked as intended. The Nexus 8 in particular was much appreciated by the both of us, freeing us from the irritation of the Brompton two-shifter-for-six-gears system. Our two shifters now give us pretty much all the gears we need, with a total range that approaches that of a Rohloff Speedhub. The range of the Nexus 8 (around 300%) means that we have two usable gear ranges. For general use we can stay on the 34t chainring up to speeds of 20km an hour before shifting to the 50t chainring at higher speeds. Using the gears this way gives six gears (low 6,7,8 high 6,7,8) with roughly even gaps between them. Although not as convenient as a Rohloff, the two chainring system with a hub in the rear wheel is a lot simpler to use than a three chainring derailleur system. 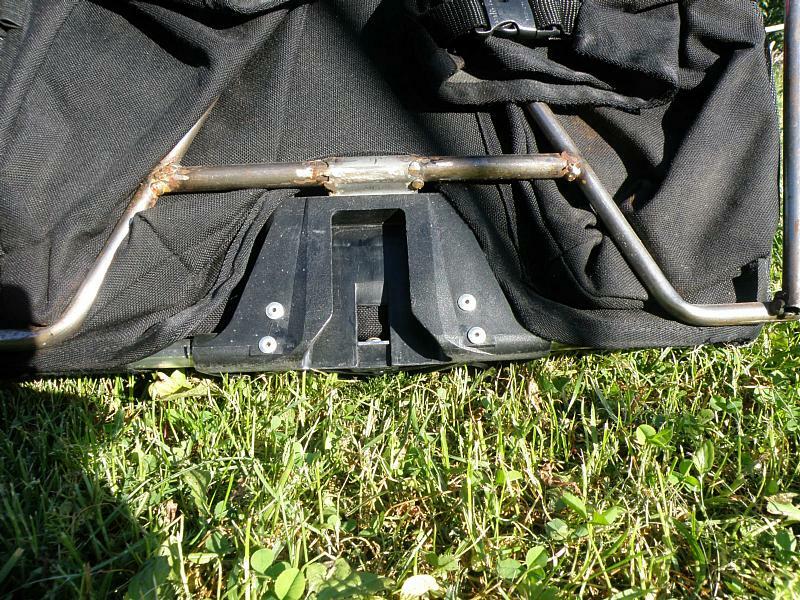 The Brompt-o-lieb luggage system worked well without any failures and the luggage blocks screws did not loosen off. I put this down to the fact that with a Brompt-o-lieb system the forces on the luggage block are much better balanced. This also means that the bike handles much more securely, there is none of that disconcerting wagging you get with a heavily laden Brompton bag as it wobbles on the luggage block. We both liked the adjustable handlebars: I used them in the “foldable” position when cycling into stiff headwinds. In this position I was surprisingly comfortable. When we had a good tailwind I tended to put the bar ends up vertically so I could sit bolt upright on the bike. In variable conditions I had the bars in the horizontal position facing forwards. Damae usually just had the bar ends raised to around fifteen degrees above horizontal occasionally raising them more when we had a tailwind. But we had no problems with numbness in hands or fingers. I am considering getting some more of these bars for two of our other bikes. One thing that surprised us was the brakes. I’ve never been terribly impressed with the Brompton brakes and have investigated getting V-brakes bosses and brakes fitted to the front forks. While we were still living in Holland our LBS at the time (SNEL tweewielers) suggested we tried some cartridge brake blocks usually used on racing bikes together with some ‘salmon’ brake blocks. I also fitted V-brake levers to both bikes as the old style Brompton brake levers, whilst light, just flexed too much for my liking. On this trip we did not have any problems with the brakes. Either we got used to them or they work well enough now. On a steep descent we still need to pull harder than with V-brakes or Magura rim brakes but the bikes stop quickly enough. The only thing we are planning to alter is to fit new hard suspension blocks to both bikes. Even with a jubilee clip on both suspension blocks we were wasting too much energy making the bikes bounce up and down. The new blocks have already been ordered so I look forward to seeing how that improves the bikes. We will definitely be using the Bromptons in this way again in the future. They are comfortable for long days in the saddle and can now carry all the gear we like to take on holiday. With the improvements to the gears we now have bikes that we can use here in Gol or anywhere else in Norway, instead of having them sitting on shelves gathering dust. Our 16 speed Bromptons are now just that. We built our own wheels earlier in the year and I then went through the process of getting everything to work together. 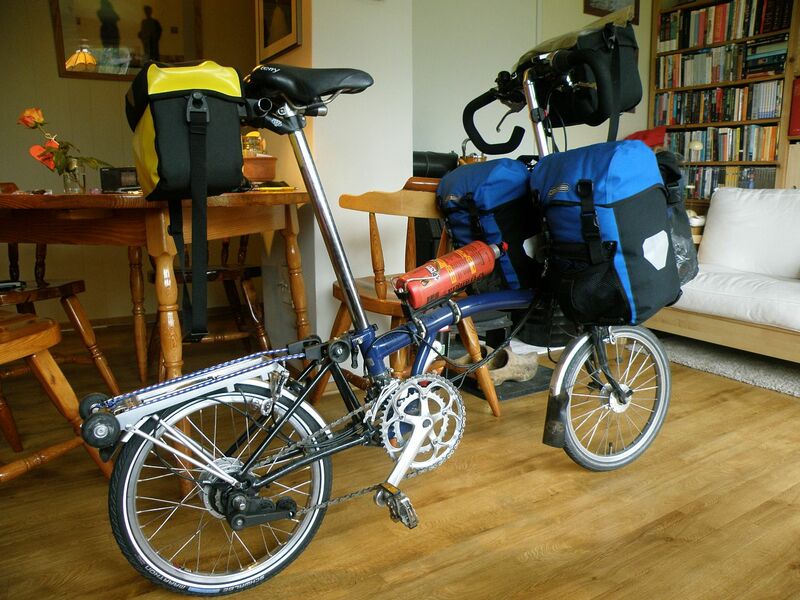 I had already spread my rear forks a couple of years ago and did the same on Damae’s Brompton. A few tweaks were needed on her bike to get sufficient clearance between the spokes where they come out of the Nexus 8 hub and the fork and the rear derailleurs had to be shaved with a ‘Drehmel’ to provide enough clearance for the Nexus 8 gearchanger. We’ve managed to put around a hundred kilometres on the bikes and they will be used for our summer tour. This will be a sedate affair because of Damae’s condition, taking in part of the NSCR in Germany and Danish cycle route 5 between Fredericia and Grenå. A travelogue will eventually get written as will a full report of the conversion. From our point of view the conversion has been well worth the effort and money. The gearchange (with the single twistgrip) is fantastic compared to the 2×3 SRAM Brompton setup we previously had. The high range on the 50t chainwheel is good for general cycling, with a bigger range than the old SRAM 6 speed, and the low range on the 34t cog allows climbing up steep hills fully laden. Only time will tell if the setup is reliable. For the time being, here are three pictures of my bike set up for touring. We’re using my “Brompt-o-lieb” adaptor frame to mount two front panniers on the back of the Brompton bag. We’ve used these a couple of times for short trips and the bikes are very stable even when loaded with weights of around twenty kilograms. At the moment the front bags and contents weigh around sixteen kilograms which is a lot less than we normally take when touring with ‘proper’ touring bikes. c) being unable to get the Schwalbe Marathon tyres off the Sun CR18 rims. Getting the tyres on is trivial with the Simson Tyre Mate (recommended purchase) but I managed to break the Var Tyre tool the first time I used it to remove a tyre. The outer edge of the Brompt-o-lieb is just visible in the picture. Loaded with 16kg the bike is much more stable than with 10kg in a Brompton bag alone. The bags can be removed as a single unit with a little extra care and carried around without removing the Ortlieb bags. View of the ‘cockpit’. There is plenty of knee room when cycling. Starting off takes a bit more care with positioning the pedals for the first down stroke. The handlebars are adjustable with a long allen key the lower sections can rotate upwards. In this position the bike still folds. I modified the handlebar stem using a rigid seat post rather than a sprung one as is more usual. I finally got the urge to do something with the box of bits that moved with me to Norway eighteen months ago. Fitting the eighteen trailing spokes was no problem. The trouble started when I tried to fit the leading spokes. I remember deciding on a two cross spoke pattern when I ordered the spokes. I actually got the rim and the Nexus 8 hub before I bought the spokes so I could narrow the hub first and then measure the rim and hub flange offsets and put the details into Edd. Clever I was. Except something went wrong. Tonight, I realised that the leading spokes were too long for a two cross pattern and too short for a three cross pattern. After a good half hour scratching my head and trying different things, I realised I must have made a mistake somewhere with the spoke sizes. I measured up the hub again, then the ERD on the rim and put the details into Edd and a couple of other online spoke length calculators. All gave back the same spoke lengths (138mm and 141mm) which were 3-4mm shorter than the ones I had in my box. I couldn’t find out how the mistake had occurred as no matter what I did I couldn’t get Edd to give me spoke lengths of 144mm and 142mm. Sigh. So now I have to order some more spokes. As they will be coming from the UK I have to decided if I want them sent direct here (long delays coming through customs plus a very high handling charge from the postal service) or I get them sent to friends in Holland or the UK and pick them up on my next visit. I’ve spent most of the last two days upgrading the Moose and the Troll (the Halfords ‘Limit’ bikes) and now both have a Rohloff in their back wheel. The results are very pleasing indeed. Especially so as I’ve wanted to do the upgrade for a few years now and the results are exactly as I expected. I’ll post a few pictures of the conversion soon. It isn’t a difficult job, if you can swap and adjust derailleur gears then should be able to install a Rohloff wheel into your new bike.